Justice Stevens announced his impending retirement today. Eleven days before his 90th birthday, Stevens said he would step down when the court finishes its work for the summer in hopes that a replacement could be confirmed well before the next term begins in October. Doug Kendall takes a look at Justice Stevens tenure on the Supreme Court, and the various issues involved in the selection of his replacement. 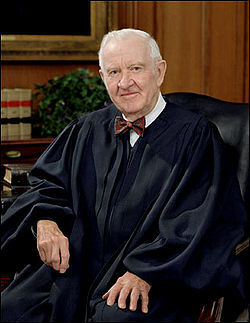 Though few Americans could recognize the soft-spoken, bow-tied Justice if they met him on the street, over the past 10 years Justice Stevens has emerged from the shadows of his liberal predecessors, such as William Brennan and Thurgood Marshall, to become a towering figure on the Supreme Court and one of our nation's greatest Justices. He has assumed a dominant role on the Court not only from his seniority, but through the force of opinion-writing and his ability -- as a Republican appointee, and the Court's only remaining WWII veteran -- to bridge the Court's ideological divide. Among his recent written opinions are numerous progressive victories for the Constitution and the rule of law, including Gonzales v. Raich (2005), Hamdan v. Rumsfeld (2006), Massachusetts v. EPA (2007), and Wyeth v. Levine (2009). It is perhaps true to say that no American since Ben Franklin has played a greater role in the course of American history after his 80th birthday than has John Paul Stevens. On a personal level, the thing that most fascinates me, is that Stevens, one of the most liberal members ever to serve on the Court, was appointed by a Republican president, Gerald Ford. This speaks volumes as to how much the Republican Party has digressed from what it once was; the loyal opposition party of our once great Republic, in to a party ruled by what were once considered the fringe elements..